Robert McCloskey: A Private Life in Words and Pictures has more than fifty examples of McCloskey’s art that have rarely been seen outside the family and with nearly fifty more of his beloved drawings and paintings. 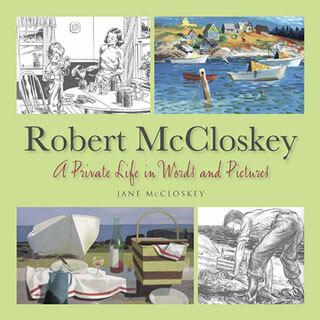 We are delighted to announce that "Robert McCloskey: A Private Life in Words and Pictures" by Jane McCloskey has been named a 2011 Book of the Year by ForeWord Reviews. Kittery, ME - June 27, 2012 - ForeWord Reviews, the magazine of independent publishing, has announced that Robert McCloskey: A Private Life in Word and Pictures by Jane McCloskey, published by Seapoint books (an imprint of Seapoint Books), has been awarded the Silver Medal in 2011 Book of the Year Awards in the Biography category. The Book of the Year Awards represent the best independently published works from 2011, and are selected by a panel of librarian and bookseller judges. Robert McCloskey is one of the most beloved American children’s authors of all time. His eight books, including Make Way for Ducklings, One Morning in Maine, Time of Wonder and Burt Dow Deep-Water Man are 20th century icons, winning two Caldecott Medals and two Caldecott Honors for Books. Yet little is known of Bob McCloskey’s life. As his younger daughter Jane describes in this moving memoir of Bob and his family, he was a shy, quiet man, was reluctant to talk about himself or his work. His work spoke or him. He and the family did indeed live on the Maine island that figures so largely in many of his books. But they also lived in New York State, in St. Thomas and among the ex-patriate artistic set in Taxco, Mexico, where his children watched him have a nervous breakdown that affected the rest of his life. Bob McCloskey really did write and paint what he knew: from his Midwestern childhood to island life in Maine. Jane McCloskey chronicles the loving, difficult but productive family relationships in a way that will add depth and meaning to his wonderful books. About the author: Jane McCloskey has been many things, including house painter, Christmas wreath maker, environmentalist, and writer. She lives in a house she built herself on Deer Isle, Maine, near the island where she grew up. She is Robert McCloskey’s younger daughter and appears in many of his books.